We’ve looked at lots of techie stuff lately so I thought we should step outside the camera for a while and look at photography tips that live in the physical, moving about world. Photographic composition often has little or nothing to do with camera settings and a lot to do with where you’re standing ­ or kneeling, laying, sprawling or hanging. (Check out the Rule of Thirds and Long Lenses tips in Photography Videos). Point of view has a massive impact on photographic composition. Just by moving yourself into a position where the view is seen from an unusual angle an image instantly becomes noteworthy because it’s not the norm. To shoot this picture of Lorna ­ I’m down on the ground with my face in the pavement! If you have a camera with a flip out LCD on the back it makes life much easier because you don't end up with gravel rash on your cheek! By the way, photographing people from a low angle not only makes the shot unusual - it also adds an element of power to the subject. Composition in food photography is often done from the side because you don't often see your starter from the side at table top level - you almost always see it from above. Even when food is photographed from above it's usually done looking straight down - again this isn't how we normally see our dinner. Next time you're in a restaurant try looking at your food from a normal sitting position - then stand over it and look straight down onto it and you'll see what I mean. 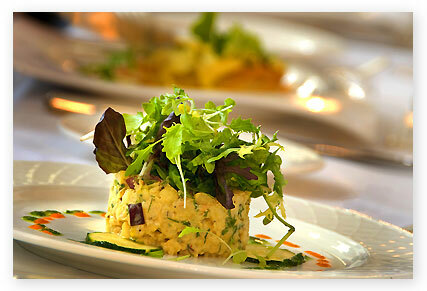 So just by getting down to the level of your own dinner you're making a difference! 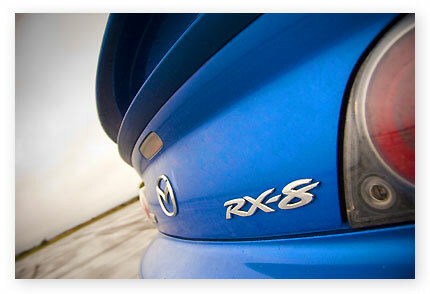 This photo of the back of a Mazda RX8 was taken on one of our One to One photography courses. Nick Robinson wanted to get a handle on photographic composition - so we took his car out in the rain, got down on our hands and knees and this is one of the results. Spare a moment to look at everyday objects from an unusual point of view. If you’re brave and don’t care about people staring at you ­ do it on public places as well as at home. 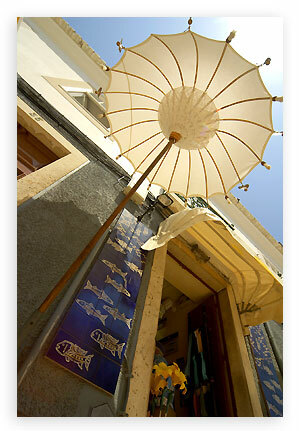 When viewed from standing height in the street this image of a sunshade outside a shop doorway in Portugal looked pretty mundane. I needed to make the image powerful because it was for an advertising brochure so I tried lying on the pavement and looking up at it to see what it would look like. Not only did the change of point of view add dynamism to the composition - the low angle meant the brolly itself was backlit and brought to life. Now I know not everyone's comfortable making a spectacle of themselves by lying in everyone's way and getting stared at. But about the worst thing that can happen is you'll be asked to move out the way - and at best people will think you're a professional. Either way the discomfort is minor compared to the satisfaction you get from taking images you're proud of and delighted with. I think pretty much everyone has watched Top Gear on the BBC and marvelled at the stunning photography. Well the guy lying in a muddy ditch at the bottom of the page is BBC Top Gear cameraman Iain May - and we all know the amazing images he shoots. 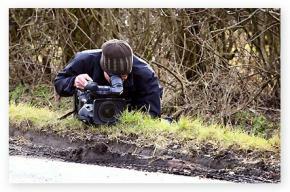 Notice how he’s not only in a ditch, but he’s also using a tuft of grass as foreground. If you’d like to more about photographic composition or anything else to do with photography, take a look at our Ultimate Beginners Course. Or if you’d like to get some real value photography training, come on a One to One photography course with me and we’ll work on whatever areas of photography you need to. 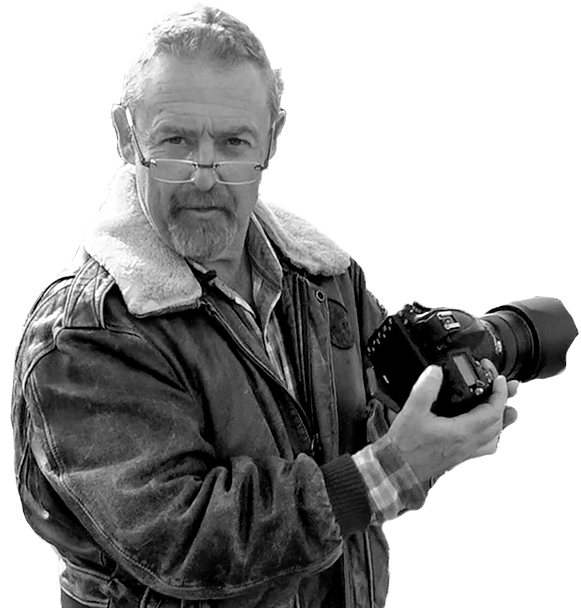 A couple of weeks ago I was teaching Iain May Photoshop - and it was this pic of him that gave me the idea for this photography tip.